As a lover of wild animals, my media feed spans the globe for wildlife conservation stories. This fall and winter, however, I have not needed to search far in following one of North America’s liveliest conservation debates: who should have the authority to manage wolf populations in the northern Rockies? The latest installment in the local newspaper, the Salt Lake Tribune, arrived on my front porch this morning, reporting that a federal judge has merged two lawsuits filed by coalitions opposing the recent transfer of wolf management from the federal government to the state of Wyoming effective last September 30. A third lawsuit filed just last week calls for the creation of a no-hunting zone surrounding Yellowstone and Grand Teton national parks to protect the wolves who wander just outside park boundaries. Today’s article quotes Wyoming governor Matt Mead as calling the fall wolf hunting season, which ends December 31, a success. With less than a week before the season’s end, he points to the likelihood that the “conservative” quota of 52 trophy wolves probably won’t be met as proof that the “doomsday” scenario of environmentalists is extreme. On the other hand, wildlife advocates, including many scientists, are not convinced that the wolf population in the northern Rockies is large and stable enough to survive this level of hunting. 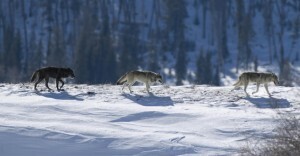 In Montana and Idaho, where wolves are now also under state management, they can be trapped as well as shot. Many wolves killed by humans are wearing tracking collars, and their demise hampers scientific understanding of the species’ sustainability under these new management regimes. In the 1990s the virtually nonexistent wolf population in the northern Rockies of the U.S. was resuscitated with the introduction of wolves from Canada into Yellowstone and central Idaho. That the species has so far rebounded is indisputable, but has it recovered to the point of surviving the different management approaches of the various jurisdictions through which it ranges? This is one conservation story that wildlife observers in the West will be closely following in 2013. And you can follow the wolf packs of the Lamar Valley on our Yellowstone Wolf Quest and Yellowstone: Ultimate Wolf & Wildlife Safari trips, with departures now through March.